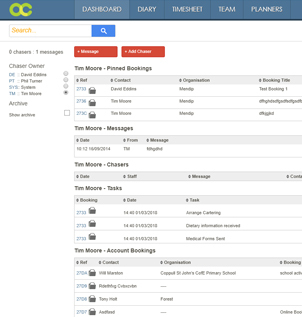 Activity Cloud is a Outdoor Centre Management System designed specifically for the Outdoor Education Sector. Curious to find out more? Browse through our website and get in touch if you would like a demo. 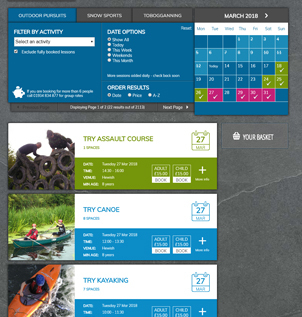 Activity Cloud was initially developed out of necessity to enable Mendip Outdoor Pursuits to run its business. It didn’t start as Activity Cloud, it started in 2005 as a simple database of customer names and notes on bookings. Over time this developed in to a visual ‘DIARY’ of events and a full ‘TEAM’ management system. We then added online sales and loads of other useful features. In 2014 we took all the best parts of what we’d learnt and created Activity Cloud. At Activity Cloud, we don't believe in penalising success, that's why we don't limit your users, customers or bookings. 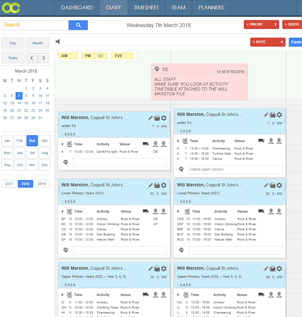 Lay out programmes in a visual format that allows simple oversight of a day or month. Quickly see where you may have further opportunities to deliver more sessions and who in the team you have available. Manage the team with activity allocation and other responsibilities. The 'Timesheet' allows you to set the rota with start and finish times, set roles and log hours. You can see your shift information in month or day view. Your team will know when they're working and what they're doing. Keep details on your customer and what they require from their booking. Manage the customer from initial enquiry until delivery and beyond, into the next booking. Delegate tasks and ensure your team know what the customer requires. Build an inventory of activities for sale online. Manage prices, content and online sales information. Sell spaces online through your dedicated, personalised, online shop. Easily manage spaces booked online and over the phone. 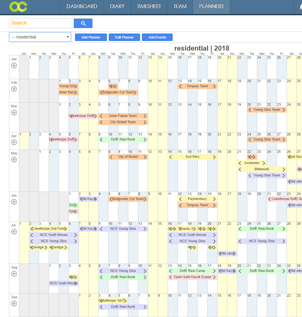 Create as many wall planners as you need, with dates as far into the future as required. Link blocks on your planner to customers and link planners together so different teams and departments can access information as they need it, without duplication. Link your team to their qualifications, their evidence of qualification and the other training. 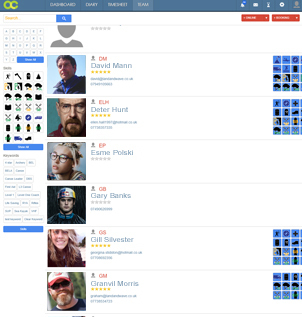 Find people within your team and freelance list based on their skill set and know when qualifications will expire. Manage session observations, appraisals and company specific skills. Manage your equipment inventory, with equipment logs, checks reminders and check logs. Equipment history, date of entry and reminders for removal or review. Know what you've got and how long it lasts. information is knowledge, knowledge is power! Move quickly between information on your customers and team. Know who's got what on and where everything needs to take place and do it while other people check the system at the same time. 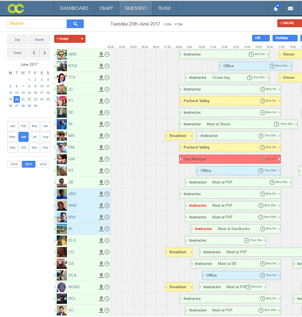 Manage your work flow, easily see your current set of on going bookings, set chasers and reminders. Delegate or set booking specific tasks and message the rest of your team internally. Monitor bookings and get notified when someone else updates a booking you manage. Use reports to analyse your business, understand who you work with, what they do and what they're worth to your company. Know what still needs doing with your upcoming bookings, who is delivering activities for you and how many hours they've worked. Your system is fully backed up every hour, both on our cloud server plus another physically separate location. Your data is then backed up again, daily, to a third secure location. Your system is also encrypted end to end and some critical data is further encrypted on the storage system. Access to your data is important but some of the team may not need to see everything or change anything. Separate function permissions allow you to decide who can do what and when. Your team can now take responsibility for knowing what's going while you take responsibility for your data. Create dynamic emails for common purposes, such as booking confirmations or requests for information. Build templates including common elements and control the visual impact with full access CSS. Upload all your documents and supporting information to the cloud knowing we can add as much storage as you require. Additional storage can be added to massive levels at very small additional cost. Deal with customers centrally while delivering programmes at centres across the country or the world. Let each centre schedule and maintain their own staff and programme specifics, while managing the booking process in one place. We're adding new features and reports all the time and our customer's feedback drive our direction and development, we can't wait to hear what you think. Just get in contact, we'll then arrange a call, introduce ourselves and answer any questions you might have. We can then demo Activity Cloud and if you feel it will work for you and your team we simply set you up a free system, until you're ready to commit. It's free to set up and free until you start using it with your team, to manage your customers and people. The core system is then £100 per month. However, it's half price for the first 12 months. Less than the cost of one activity session! Introduce another customer and get £5 off per month, for life, each time. 8 Reasons to Get in Touch Today. 1. - We fully understand that moving over to a new way of working requires your team's full support and that there are only a few times in the year when this can happen. Most of our customers want to look at the options, then start adding in data at the end of the season or in the New Year. This is a great idea and we wouldn't recommend anything else. However, getting the ball rolling early allows you to start planning for a transition. 2. - We are happy to provide virtual tutorials through Skype and / or visit you at your centre to help you get set up. This learning and consolidation can take a few weeks so you will want to get started sooner rather than later. We are also very happy to host you at Mendip Activity Centre and give you a tour of our operation, it's always great to share ideas. 3. - Finding out more and taking up a free demo system is literally FREE. We admit that Activity Cloud may not work for every company but it is always worth finding out more. Many of our customers set up their system now and only add in bookings for the next season; if that's the case we won’t make any charge until that next season or the end of this one. 4. - We are always clear that adding information into Activity Cloud isn't necessarily faster than your current system and that the power of Activity Cloud is only as good as the data you enter. However, we have found time and again that hundreds of people hours can be saved by having all your information in one place rather than many and in the analysis of your information. We also know that once information is in the system future bookings from the same customer become a lot quicker to deal with, it will save time. 5. - We have found that opening up Activity Cloud access to your core delivery team and other support staff allows your team to be better informed of their roles and responsibilities. This enables your team to take responsibility for their own time management and planning. This can reduce the risk of things being missed and put the emphasis on your team to ask questions about what isn’t clear, rather than expecting to have everything explained. 6. - Without wishing to be dramatic; what would happen if your office burnt down or a member of your senior or administration team left your company without warning. Would this impact your business? Would critical data about your customers or their programme be lost? If this might be the case you may wish to make a change. 7. - We are not just software engineers, we are outdoor activity experts, who happen to be a bit good with IT. We know how the outdoor industry works and we live it every day. Of course, we don’t fully understand how your business works but we will understand your challenges and methods, we love to adjust our thinking and systems to accommodate new ideas. David started in the outdoor industry in 1995. In 2005 he bought the company he worked for from it's founder. David grew his new business from £280k a year to over £2m today. Much of that growth was made possible by Activity Cloud. Tim started creating websites and building databases in 2001. In 2005 he started a week's work building a customer database for Mendip Outdoor Pursuits. After freelancing for Mendip for 3 years he joined the Mendip team part time. In 2012 Tim and David founded Activity Cloud and started offering their experience as a service for the Outdoor Industry. The need to make information accessible, useful and secure has been a core drive behind the digitisation of systems that originally started in a paper format. In 2005 David took over Mendip Outdoor Pursuits and could see the need to modernise the paper based systems that limited how information could be accessed. Information was also vulnerable to loss or damage. However, the biggest limitation to growth was ensuring the administration team and delivery team knew what was happening, when, where and delivered by whom. In 2005 Mendip Outdoor Pursuits contracted a local web development company, Redshift, to build them a new website. In doing so David worked alongside Tim, the web company’s coder, to manage the project. It quickly became clear to David that there was little difference between a simple website, driven from content in a database, and a database to hold customer information. In late 2005 David arranged a week of Tim’s time through Redshift and sitting together at a PC the first iteration of a customer management system was born. The benefits of this basic start were obvious and profound; so much so that over the next 3 years Mendip booked 20 weeks of further development, adding features and improvements. In 2009 Redshift changed direction and Tim became available on a part time basis. The decision was simple; Mendip employed Tim for half of his working week. The system jumped on again and finally integrated a visual, digital ‘Diary’ of activity programmes, along with the first phase of team rotaing and ‘Timeheets’. Just 3 years later, a few things happened that turned this ever growing system into Activity Cloud. In September 2012 Mendip made early plans to take over a local, failing, dry ski slope. At this point Tim was in the USA cycling from Boston to San Francisco. At the same time Reshift decided to get out of the web design business. The operation of a ski slope required a lot of software development and adding new features to the booking system; luckily Tim was about to become available full time. Tim and David decided that since it required both of them, in equal measure, to make the system work they would set up Activity Cloud as a separate company and share the ownership of their creation 50:50. It was this move that sparked the idea that the system could be turned into a service for others in the outdoors. Nothing happened with the idea until 2014 when Land and Wave, a fast growing company on the Dorset coast, posted on Facebook asking if anyone knew of a system for managing customers for the outdoor industry. David contacted Land and Wave and after a great meeting in Dorset Tim took all the very best features and latest coding techniques and built Activity Cloud. Making a system that is flexible enough to work for a range of potential customers and with some really great features. We are growing slowly because we can; however, we believe we have a system that is ideal for any organisation that provides a number of different activities, for a number of different customers, with a number of full time or freelance staff. We can't wait to find out what you think. "I'm not sure we could function properly without Activity Cloud"
We'd love to hear from you. Contact us today to learn more about Activity Cloud and how it might make life become more simple.